Knight Fury is not a normal band from the US, it’s a real super-group from Arizona. The members of this band are well established in the US-scene like Chris Sanders on guitars (ex- Lizzy Borden). Dave Ellefson on bass and Ken Mary on drums may be known to metal-fans as (former) musicians in bands like Megadeth and Alice Cooper. 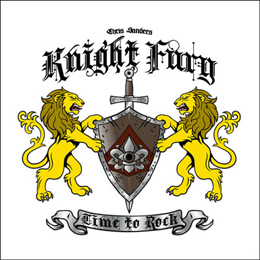 Time To Rock is their debut-album and was produced by the band itself in 2011. The album offers melodic heavy metal, which might remind some metalheads to the older Leatherwolf. The music is dominated by a really 80’s sound. Opener “Nothing” is really bombastic and very catchy. Last but not least we shouldn’t forget the very original voice of William King, which makes this album an absolute must- have for fans of old school heavy metal. This is actually a band you should check out! We hope that we can check out really quick this band live on stage!